Thank God Saddam is finally back in American hands! He must have really missed us. Man, he sure looked bad! But, at least he got a free dental exam today. That’s something most Americans can’t get. But then he screwed up. He invaded the dictatorship of Kuwait and, in doing so, did the worst thing imaginable — he threatened an even BETTER friend of ours: the dictatorship of Saudi Arabia, and its vast oil reserves. The Bushes and the Saudi royal family were and are close business partners, and Saddam, back in 1990, committed a royal blunder by getting a little too close to their wealthy holdings. Things went downhill for Saddam from there. But it wasn’t always that way. Saddam was our good friend and ally. We supported his regime. It wasnt the first time we had helped a murderer. We liked playing Dr. Frankenstein. We created a lot of monsters — the Shah of Iran, Somoza of Nicaragua, Pinochet of Chile — and then we expressed ignorance or shock when they ran amok and massacred people. We liked Saddam because he was willing to fight the Ayatollah. So we made sure that he got billions of dollars to purchase weapons. Weapons of mass destruction. That’s right, he had them. We should know — we gave them to him! And here are some of the American corporations who helped to prop Saddam up by doing business with him: AT&T, Bechtel, Caterpillar, Dow Chemical, Dupont, Kodak, Hewlett-Packard, and IBM (for a full list of companies and descriptions of how they helped Saddam, click here. We were so cozy with dear old Saddam that we decided to feed him satellite images so he could locate where the Iranian troops were. We pretty much knew how he would use the information, and sure enough, as soon as we sent him the spy photos, he gassed those troops. And we kept quiet. Because he was our friend, and the Iranians were the "enemy." A year after he first gassed the Iranians, we reestablished full diplomatic relations with him! Later he gassed his own people, the Kurds. You would think that would force us to disassociate ourselves from him. Congress tried to impose economic sanctions on Saddam, but the Reagan White House quickly rejected that idea — they wouldnt let anything derail their good buddy Saddam. We had a virtual love fest with this Frankenstein whom we (in part) created. And, just like the mythical Frankenstein, Saddam eventually spun out of control. He would no longer do what he was told by his master. Saddam had to be caught. And now that he has been brought back from the wilderness, perhaps he will have something to say about his creators. Maybe we can learn something… interesting. 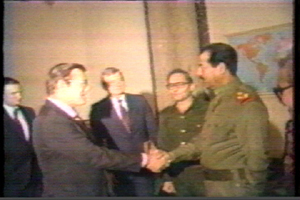 Maybe Don Rumsfeld could smile and shake Saddam’s hand again. Just like he did when he went to see him in 1983 (see photo above). Maybe we never would have been in the situation we’re in if Rumsfeld, Bush, Sr., and company hadn’t been so excited back in the 80s about their friendly monster in the desert. Meanwhile, anybody know where the guy is who killed 3,000 people on 9/11? Our other Frankenstein?? Maybe he’s in a mouse hole. Stay strong, Democratic candidates. Quit sounding like a bunch of wusses. These bastards sent us to war on a lie, the killing will not stop, the Arab world hates us with a passion, and we will pay for this out of our pockets for years to come. Nothing that happened today (or in the past 9 months) has made us ONE BIT safer in our post-9/11 world. Saddam was never a threat to our national security. So, i saw the final episode of this trilogy tonight and i must say that those three movies was probably the best I’ve seen ever. The last movie sums up everything superbly and the effects are breathtaking. If you’ve haven’t seen it, do it. You wont regret it.